Looking For Caterer Fast Food Restaurant? Located in Toronto, Ontario with multiple Toronto and area locations, Select Sandwich is a premier Catering Service that serves both business and home clients. 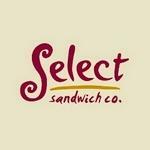 As Ontario's number one business catering network, Select Sandwich serves more than 30,000 catering events each year. They offer a superb selection of Wraps & Paninis, Platters, Soups , Apopetizers, and much more.